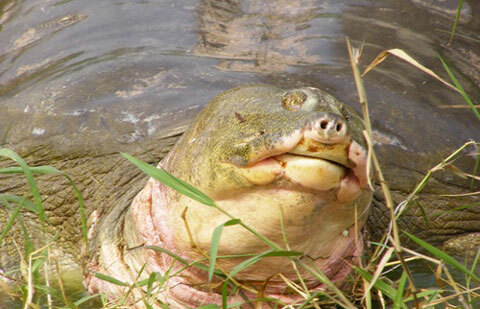 VietNamNet Bridge – Dr. Tran Binh, Director of the Institute for Biological Technology, on April 18 told VTC News that the institute had finalized the DNA test of the legendary turtle in Hanoi’s Hoan Kiem Lake. “We will report the test results to Hanoi authorities and the information will then be widely announced to the public,” Dr. Binh said. According to Binh, Hanoi authorities planed to announce the DNA test results later this week. “Our test results are not different from previous statements of Vietnamese experts. The turtle is feminine gender and a new species. It is not a Chinese or Dong Mo turtle species,” Dr. Binh added. Binh said the turtle genetic sample will be sent to the World Gene Bank in Switzerland. “After the World Gene Bank receives the sample, Vietnam can make public that the legendary turtle in Hoan Kiem Lake is a new species, named Rafetus Vietnamensis or Hoan Kiem turtle,” said Binh. Binh said the turtle may be sourced from the Red River from millions of years ago. Dr. Bui Quang Te, chief of the turtle treatment group, said that the turtle’s health is very good now. “We are going to complete our treatment mission later this month,” he confirmed. He repeated that the urgent task is cleaning up Hoan Kiem Lake, so the ancient turtle can return to its clean natural environment. However, the cleaning process seems to be slow. Earlier, experts suggested using carbon fibers, specialized sterilization substances and ultrasound waves to kill algae and bacteria in the lake.